I’m not going to tell you about its incredible history, you have Wikipedia for that. I’m not going to tell you that it’s a UNESCO World Heritage Site (well,.. I just told you), or that King Alfonso VI of Castilla ordered their construction in the 11th century. I’m going to tell you about the experience of seeing the walls. It’s possible that you are someone who doesn’t like to follow the typical tourist path when you go to a city. Well, the most typical thing to do in Ávila is see the walls, and if you don’t walk around the top of the walls like everyone else, you’re really missing out. Visit them. See them. Climb them. Walk them. Not just from the outside, but paying the 4 € free and walking around the walls. Do it! It’s an order! Seriously, it’s completely worth it. It will take you back to another era and give you an idea of what a city needed to be able to survive those times. You’ll be surprised at how well conserved they are (which began back in 1596 when King Felipe II ordered restoration work done on the walls). The walls are the monument that best identifies Ávila . Built throughout the 12th century, they have a perimeter of 2.5 KM. You can follow them along the outside of the city, discovering the nine entrances called:del Alcázar, Peso de la Harina, San Vicente, el Mariscal, del Carmen, San Segundo, de la Malaventura, de la Santa or Montrenergo, del Rastro). Following the perimeter of the walls from the outside lets us ee how they were built according to the terrain. They’re taller in the flat areas and lower in the areas that would be more troublesome for possible attackers. Remember that you can climb up to the top of the walls and walk around the city. Take the time to absorb the views of both the urban city center and the nature to the distance. You can access the top of the walls from three points: the house of the CArnicería, the Puerta del Alcázar, or from the Arc of Carmen). 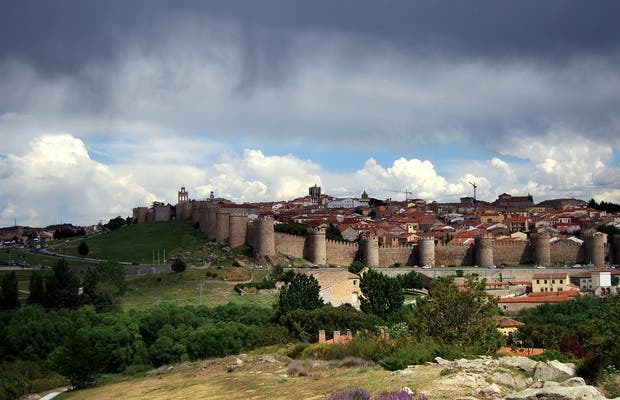 Ávila, with its 1,100 meter-high walls, is the capital of the most elevated providence of Spain. Due to the elevation, it’s usually fairly cold, even into the Spring. UNESCO has only recognized a handful of entire cities around the world as World Heritage Sites, and Ávila is one of them. That honor is due in large part of the incredible city walls that still circle this ancient city. They were originally built hundreds of years ago but have been marvelously preserved and are in truly incredible condition. Entering through the gates is like entering another world. Tickets to the wall cost five euros and you can explore almost the entire stretch. There are two entrances: one is near the cathedral and lets you get an amazing up-close view of the spectacular Ávila Cathedral (the first Gothic cathedral built in Spain) from above, and the other lets you take an extended walk down the side of the city. The entire wall is covered in look-out towers which offer amazing views of the surrounding countryside and the red roofs of the historic center. It's an amazing sensation and made me feel like a little boy again, scurrying around the top of the walls like I was some kind of imaginary knight back in the medieval times.